Communities@Work joins forces with the local business paving way for inclusion in the workplace. If you enter the Kingston markets on the weekend, you’re likely to be hit with the sweet and tantalising aromas of Krofne Donuts. And if you follow your nose, you will find sugar-coated Croatian yeast raised donuts, oozing with Nutella or jam and the friendly Krofne team there to greet you with a smile. Despite being some of the most delicious donuts we have EVER tried, there are more to these tasty treats than meets the eye. Krofne Donuts is not your typical business. They are a social enterprise that, in the process of generating profit, aim to create employment opportunities for teens and adults with special needs. Founders and owners Danijela and John Vrkic started the business with the vision that their son, Anthony, who has Down Syndrome, would be fully involved in the production, sale and distribution of the donuts. 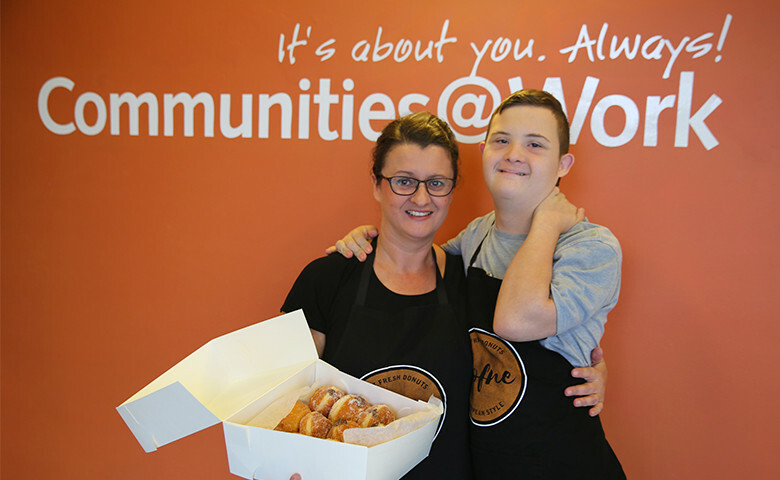 Fifteen-year-old Anthony attends our Teens After School Care Disability Program in Gungahlin three days a week and helps make and sell the donuts on the weekends. “One of Anthony’s jobs is to roll the donuts in sugar. He also really enjoys engaging with the customers as well. People love to come and chat with Anthony and see him working behind the scenes,” Danijela says. Her vision was brought to the attention of our CEO, Lorcan Murphy, through our Director of Lifestyle Services, Jo Cochrane. Lorcan has since been working one-on-one with Danijela to help her grow her business and create more employment opportunities for local people with special needs. “People like Danijela are an inspiration! Her passion, enthusiasm and drive to make Krofne a success and, as a result, give Anthony future employment, is contagious. The opportunities that could unfold as a result of ventures like Krofne are immense. We have many young people in our Disability program who could work for social enterprises such as Krofne. In an ideal world, Communities@Work would have a supported network of Social Enterprises that aim to achieve inclusion in the workplace,” Lorcan said. Since meeting with Lorcan, Danijela has been able to relocate her production to Communities@Work’s commercial kitchen in Tuggeranong. The Communities@Work corporate affairs team are now helping Krofne gain a stronger presence in the Canberra market. Lorcan has introduced Krofne to Westpac, the Canberra Business Chamber and helped secure some new clients in the process. Danijela was thrilled when she received the phone call from Lorcan outlining his proposal to work alongside her. “Words can’t describe how happy I am. It means that we will get the support to get this business fully functional. It will enable us to employ more young people with special needs and it means that Communities@Work will have an outlet for their clients to work. It’s a win-win situation. “I’m only one voice but when we have an organisation like Communities@Work behind us backing what we do, the opportunities are endless,” Danjiela said. In recent months, Danijela’s business has continued to grow and now has the capacity to take on an extra staff member. She contacted the program facilitator of our Young Adults Disability Program and advertised a casual position with the business. Brent Coombes was the successful applicant and has now been working with Krofne over the past month in the production and sale of the donuts during the week and on the weekends. He has been a client with Communities@Work for nearly five years and attends the program on average three days a week. “One of Brent’s key tasks is the jamming of our donuts, using our jamming machines. He is really great at feeling the weight of the donut and knowing if the donut needs more filling. And usually, he will insist the donuts need more,” Danijela laughed. Brent’s mother, Catherine, said that her husband went along with Brent for his first few shifts but found that Brent didn’t need any assistance. “He’s really taken to the work,” she says. “We’re very fortunate because Danijela knows how to relate to people with special needs and how to explain things. “He sees his parents and his sister going to work every day and achieving things on our own, so it’s wonderful for him to have the same feeling of accomplishment. I think it’s also important that he is working within mainstream society and that he is interacting with all kinds of people and building his social skills,” Catherine said.